My garden is filled with hot-colored roses and lilies, and although I love the oranges, yellows, and reds, they can be pretty ovewhelming on a hot Southern Californa day. My internet gardening buddy Hoovb, who writes the gardening blog Piece of Eden, suggested some purple or lavendar to cool it down. Now I know I have strange tastes, but I don't care for purple, and I really don't care much at all for purple-blues with salmon-orange, the dominant color in my garden. But she was onto something, and I thought about it until one day I saw Persian Berry in bloom at a nursery. What color is that? Using the most universally recognized color chart in the western world, the Crayola 64 Count Crayons, I decided the color was ORCHID. Cool pink, warm lavendar, that color. Orchid to tame my hot colors. 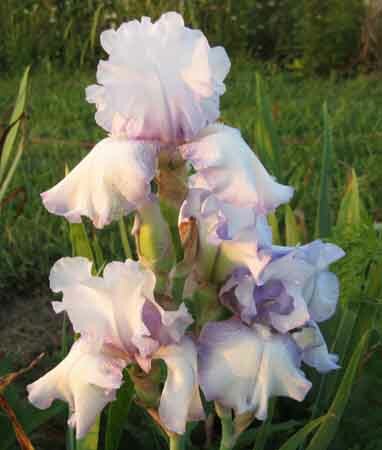 Fortunately, there are a multitude of orchid-colored irises and each is more beautiful than the last. Soon I was on the hunt for 'Jennifer Rebecca', which reblooms here in Southern California. It took a long time to become established in my garden, and it has been moved from spot to spot, mercilessly, until it finally found its home right between two screaming salmon-orange roses. 'Jennifer's' beard is the same color as the rose. What a stroke of luck! And here is the inspiration iris, 'Persian Berry'. It looks very nice with yellow, and like 'Jennifer', it has a nice orange beard. I have 'Persian Berry' in a bed with the pale yellow David Austin rose 'Allux Symphony' (aka Symphony), foxgloves, and dark reddish-violet violas. 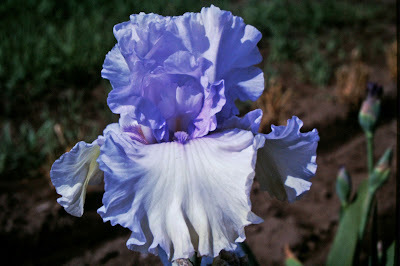 I await 'Storm Rider' from Rick Tasco at Superstition Iris Gardens to center between the two roses. To the right of 'Allux Symphony' I have 'Plum Pretty Whiskers', which reblooms for me. 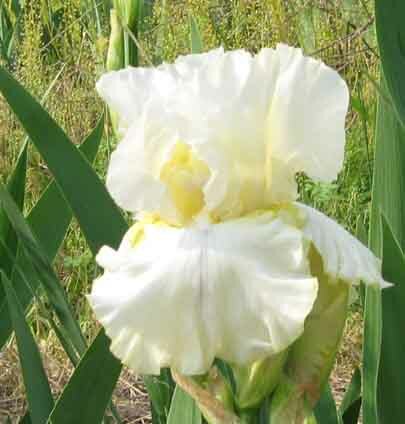 It's a lovely shorter iris, perfect for the front of the bed. The deep color in its falls was the inspiration for the dark violas and 'Storm Rider'. 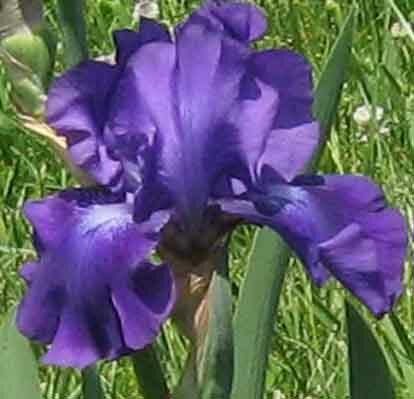 Late-bloomer 'Rhinelander' is the latest-blooming of my orchid-colored irises. It has yet to bloom this year, so this photo is from last year. I just couldn't help myself, so last season I got two more orchid-colored irises, even though (as usual) I didn't have good spots for them. 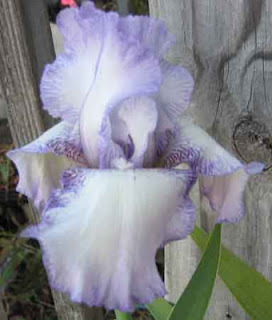 I ordered 'Orchid Pinstripe' because it is so unusual, and Randy Squires of the San Fernando Valley Iris Society gave me 'Enchanter', a huge iris that towers over the others. I am anxiously awaiting their first blooms. This year, however, I resisted buying any new orchid-colored irises, even though there were a few that sorely tempted me. Do you grow any orchid-colored irises? Or is there another color that you just cannot resist, regardless of how many you already have? Let us know which you love best in the comments section. Those who follow my program may know that 2012 was not kind to me. I was derailed for awhile due to back problems. Before the frosts hit, my physical trainer took me for a walk around the newest section of the garden. These beds were built in 2010 from an old pasture which had been lawn for over five years. 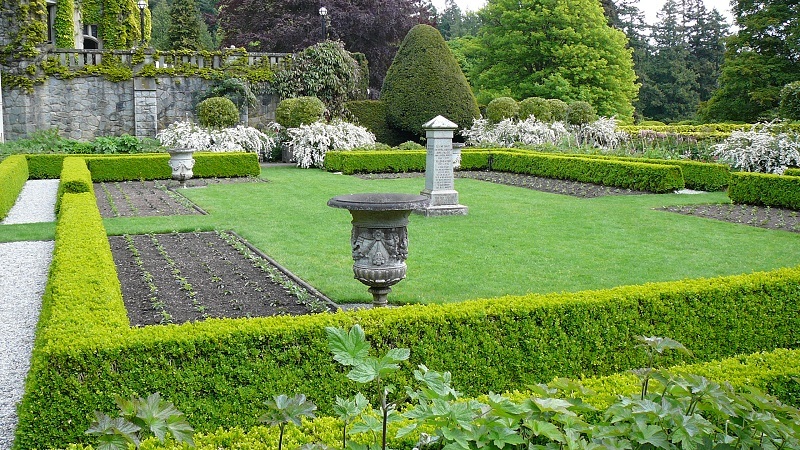 When the beds were built, I added organic material, lime, phosphate rock and green sand. I applied a little under the recommended amounts, due to my fear of rot. These beds have soaker hoses in place and are covered with a very good quality landscape fabric. No fertilizer was applied during the 2012 growing season, and no supplemental water was provided. Still, we had very good rainfall. As I rounded the back side of the garden, it was good to see several stalks blooming on 'My Friend Jonathan'. Stalks of 'Lemon Reflection' created good contrast for 'My Friend Jonathan.' Form is a bit more tailored on 'Lemon Reflection,' but it is a good parent and tends to pass on good branching. 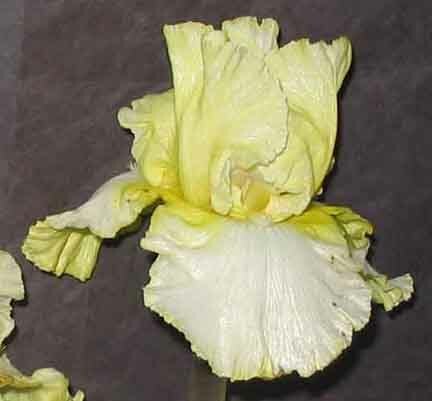 It will usually produce fall rebloom with minimum care. Several seedlings had open blooms. One was 1907-10Re, the purple one that bloomed the entire summer of 2011. It's a sibling to 'Cool Character' which I hope to introduce in 2013. They are children of 'Blatant' X 'All Revved Up. This cross produced twelve reblooming seedlings, including my only glaciata. 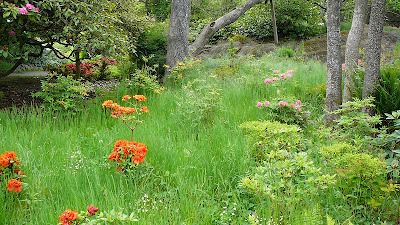 Another seedling in bloom was 2025-01Re. It's provided wonderful and consistent fall bloom for the past four years. 2025-01Re is from the cross of 'Total Recall' X 1625-01Re. 1625-01Re is from 'Star Gate' x ('Violet Returns' X Breakers.) 1625-01Re can rebloom in August and has been a strong parent for rebloom. 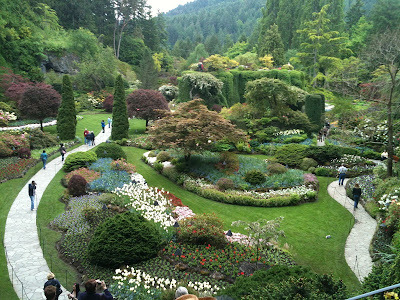 Another bed, built in 2009, is filled with irises that should be able to bloom in the summer, according to research. The bed was totally ignored in 2012. It has very good landscape fabric covering the bed, but some weeds sprout in the iris clumps. Not only was I unable to water or fertilize this bed, but I was also unable to weed it. Both 'Over and Over' and 'Star Gate' put up valiant stalks among the weeds. One would have thought they were lavished with care! October brought maiden bloom on 2542-03Re, a seedling grown in a three gallon pot. It's from 'Vanishing Act' X 'Over and Over'. Early in the spring, four of the strongest seedlings from this cross were planted into 3 gallon pots, since I was unable to walk to the existing seedling bed. As happy as I was to see this seedling bloom, it is only a success in the sense that it proved I could get rebloom from either/or both 'Vanishing Act' and 'Over and Over.' 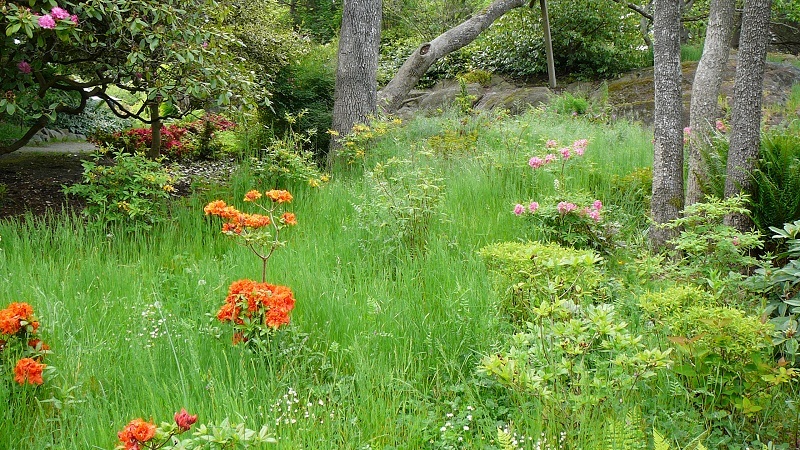 I hoped to retain the form, branching and height of 'Vanishing Act' while keeping the rebloom of 'Over and Over.' There was some measure of success, but it will take a few years to determine the seedling's potential. At first glance, the bloom is too big for the stalk and the substance is lacking. The latter is no surprise. Maybe spring bloom will temper this seedling's over achievement! Nothing will be certain until it's been grown in the ground. 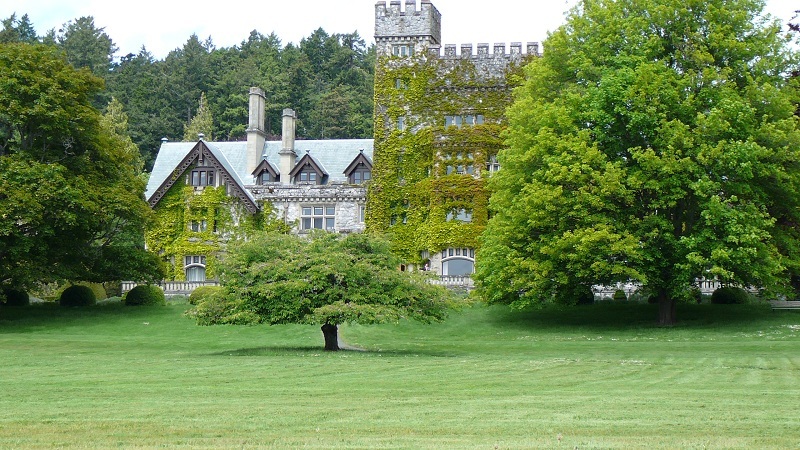 The siblings are expected to bloom later this spring. Feel free to ask any questions about my garden or my breeding program. I will answer all questions to the best of my ability. 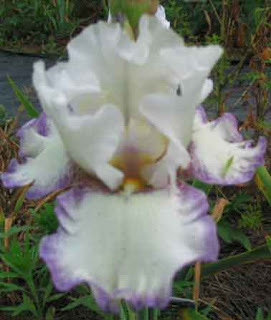 www.hort.net/lists/-Archives for Iris Talk, Iris Photos and many other plant lists. I've been an active member of both these lists since early in 1999. Interesting and informative source for research. The digital camera is the best thing since the microwave oven and it makes it so easy to take too many pictures and then just throw out the bad ones. The problem is there are too many good ones! 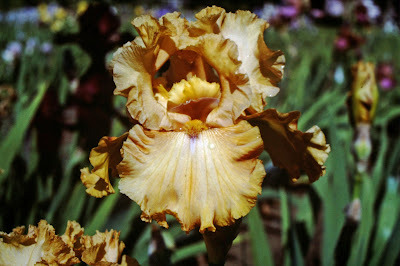 Here are a few photos I took during the American Iris Society Convention in 2011 in Victoria, Canada. 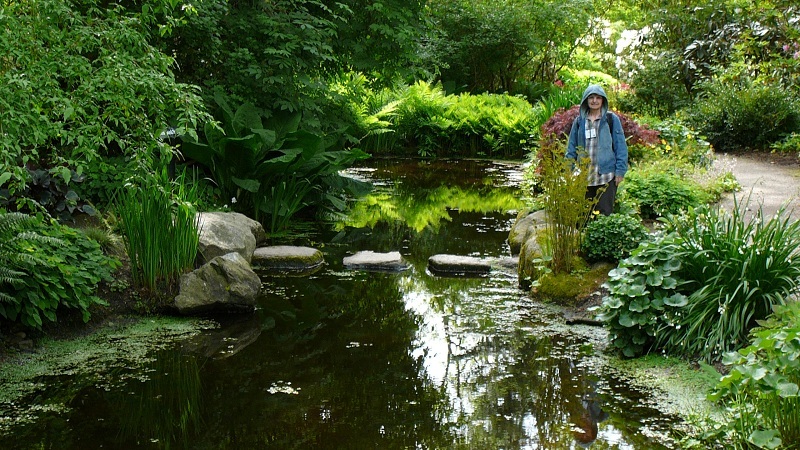 At iris conventions, like the one taking place this week in Dallas, the attendees have the opportunity to visit numerous gardens. 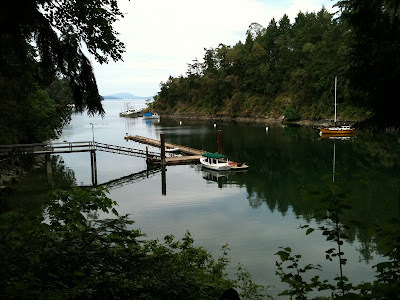 Many are absolutely breathtaking, and give plenty of opportunities to take photographs. As a lover of water irises, I had plenty of opportunities to enjoy them. 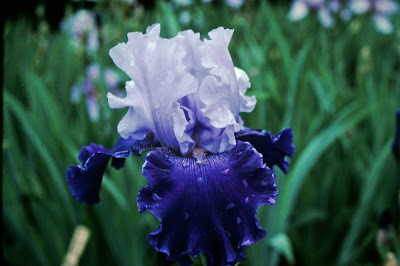 Irises were not the only specimens worth looking at. Fantastic flower beds greeted us at every garden. 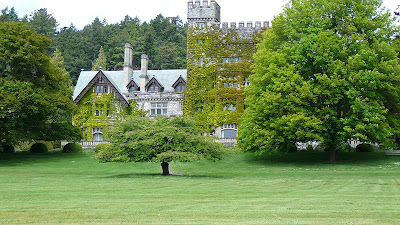 Beautiful architecture and formal gardens also beckoned. 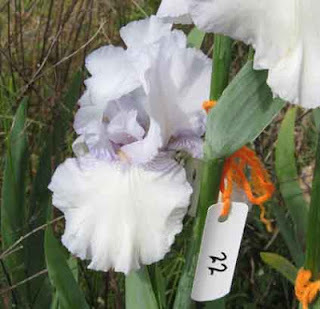 Have you been to an American Iris Society Convention? This year is a special year for conventions because you can attend the American Iris Society convention at Dallas, TX, from April 15-20 and stay for the Society for Louisiana Irises convention in the same hotel from April 20-23. Log on to the Iris Society of Dallas for more information on both conventions, and think about your vacation plans for 2014. It's early spring here in the PNW, the daffodils are showing off, our native ribes are in full bloom and attracting a complement of hummingbirds, and the tulips are just showing a touch of color. As the first bits of green start to show on the trees another early bloomer is showing off as well - our old friend 'Crimson King' (Barr, 1893). 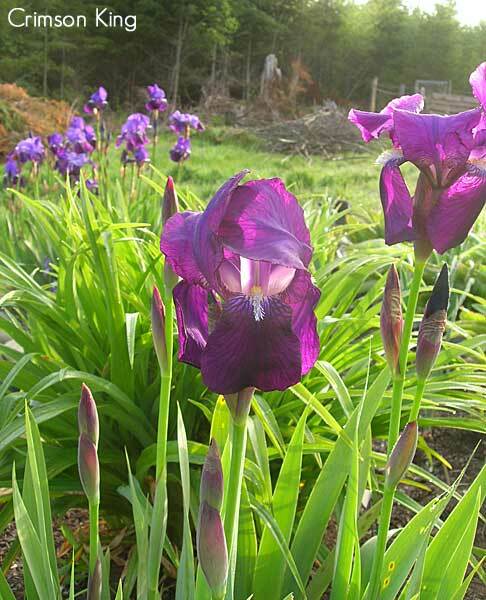 The first bearded iris of the season here in Olympia is often 'Crimson King'. There is an old Victorian home that has been turned into apartments not far from my office, and the front has a south facing brick foundation in a sheltered area where this classic old variety has been growing for years. It has never been divided and reset in the 13 years I have been watching it, yet every spring it sends up a multitude of bloom stalks. "Color effect an intense violet-purple self. Standards pansy violet, lighter to yellowish claw and wavy along the edge. Falls continga purple, almost velvety in texture. The veining is boldly spaced on whitish outer haft, while those on Kochii are not so prominent. Its fragrance is good, its color very intense, and its spathe valves deeply tinged. The persistent green foliage is attractive in winter." The substance is a bit lacking, but it is more than made up for with another trait - a tendency for repeat blooming. When it is well established and happy, a clump of 'Crimson King' is likely to send up bloomstalks over a very long period of time. One after another the stalks send out blooms, lasting an entire two-month period in my garden one year. In warm climates it has been known to rebloom in summer, as well as showing up unexpectedly at other times of the year. 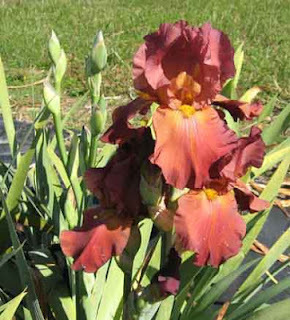 One of the hardiest and most carefree irises known, this is a favorite of many collectors of historics, and is easy to find. 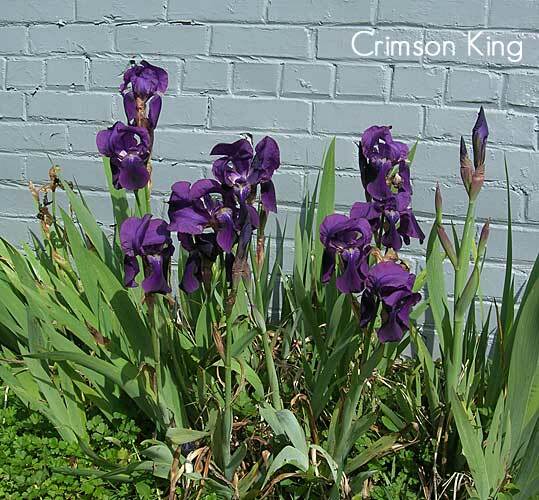 Hybridizers have since created many varieties that fit the term crimson better, but there is no doubt this one remains the King of early spring. 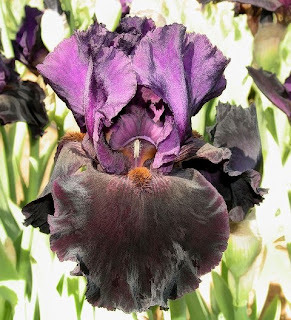 When iris season starts, as it is about to do in Northern California, I find I miss Jim McWhirter not only for his stylish irises, but even more because he was so much fun. He not only had an eye for good irises, but also for decorating and collecting. He helped me to become me addicted to collecting iris artifacts, though I never had the luck he had in discovering wonderful antiques with iris motifs. Jim McWhirter and his partner, Don Denney, first appeared at a Spring Regional Convention in 1972. They had become interested in irises and, in the company of Frances and Larry Gaulter and Vi and Walt Luihn, came down for the Sunday events at the meeting. Soon thereafter, they found a delightful old Victorian cottage on acreage in Hayward where they could grow irises. 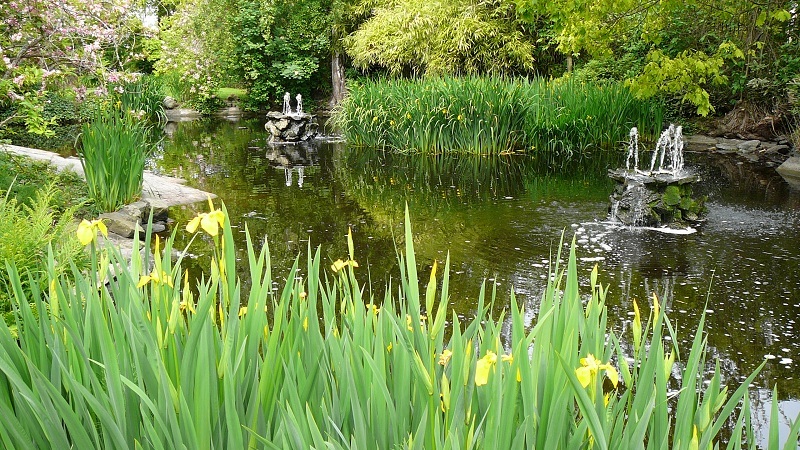 They revived the name Cottage Gardens, which had been first used by Ethel and George Johnson. By the 1978 National, they had seedlings ready for introduction. At that meeting, the AIS was introduced to Jim McWhirter's iris eye for style. Jim's first truly famous introduction was 'Tequila Sunrise', a cross of Plough's 'Amigo's Guitar' to a Gaulter seedling (Jim's connection to the Gaulters would last the lifetimes of Larry and Frances). Jim's first big award winner with the aptly named 'Brandy' from the wide cross of 'Warlord' and 'Pink Sleigh'. It would go on to win an Award of Merit and was on the Dykes runner-ups list as long as it was eligible. Other hybridizers would appreciate the diverse genetic makeup of 'Brandy' and used it in hybridizing. 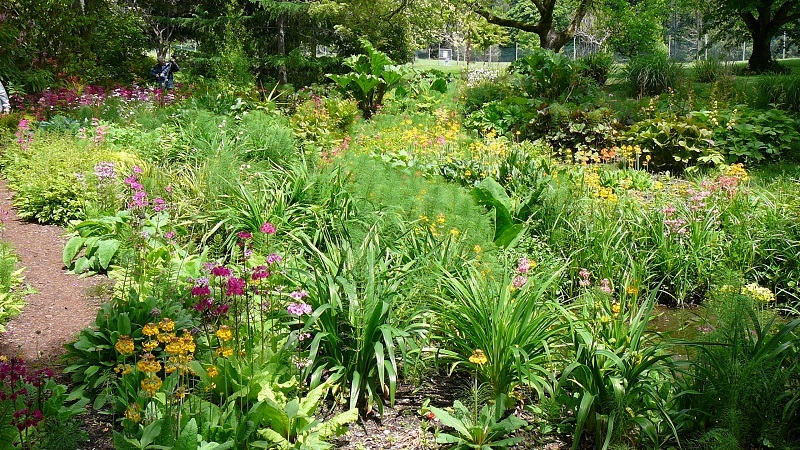 Cottage Gardens would later move to Sebastopol. 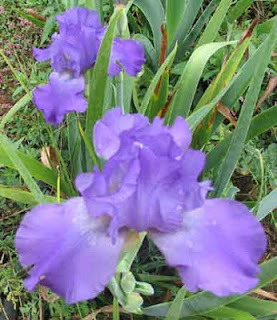 But Sebastopol, despite the connection to Luther Burbank, proved to be a poor place to grow irises and threw Jim's hybridizing off. As a result, he moved to Wilton for the superior climate, and released a wide blue-white out of Opal Brown's 'Light Fantastic' X to Larry Gaulter’s 'Carriage Trade'. Jim had the seedling for many years—we had all long admired its wonderful ruffled and wide form—but Jim had keep it back from commerce due to its tight branching. He finally released it as 'Winterscape', a name I suggested to him. 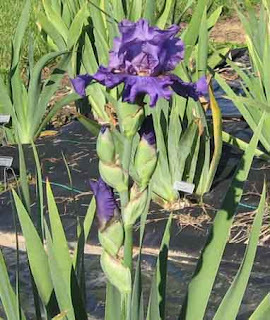 That was a wise move, as the tight branching did not pass to its children and 'Winterscape' became a wonderful parent for others, including hybridizers Duane Meek and Joe Gatty. By the time of his death, Jim was becoming increasingly interested in whites and blues. 'America's Cup' was an Award of Merit winner for him and I still grow two of his later whites, 'Helen Cochran' and 'Mother Marshmallow'. By that point, Cottage Gardens had moved into the old Keppel garden in Stockton and was called Stockton Gardens. I always liked his 'Great Gatsby', even better than 'World Premier', and continue to grow it for its velvet finished falls. 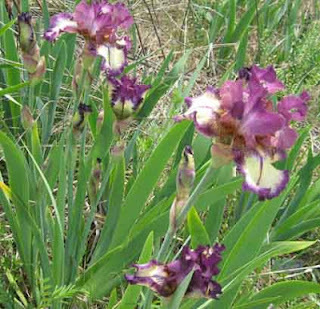 Once a hybridizer dies, their irises often fall out of commerce. 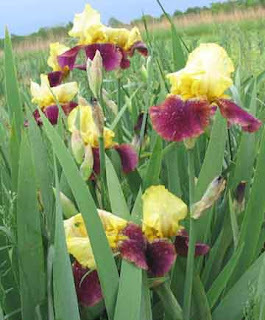 Jim's irises are no exception. 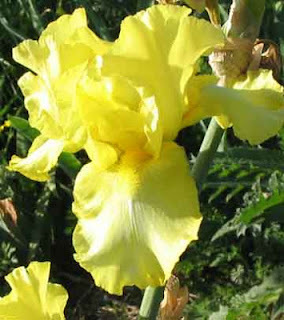 Every once and a while, though, I find 'Tequila Sunrise' listed in general garden catalogues or in the the boxes of irises that magically appear in the local nurseries in August. Sadly, I can't find a single garden still listing the metallic violet 'Holly Golightly' (Jim had wanted to name it Elizabeth Taylor, but Taylor wanted money for the right to use her name). Aside from his own hybridizing program, Jim also selected Don Denney's last introductions. As a matter of fact, Jim and Abram Feuerstein took on the last of the Gaulter seedlings and released the last Gaulter introduction, 'Alexander's Ragtime Band', which went on to win an Award of Merit. It's a shame that Jim died so early, for I'm certain that when Virginia Messick passed on, there were still some seedlings worthy of introduction, and if Jim had lived, he would have used his eye for style to find, name, and introduce them. I miss Jim for his fun personality and for his iris eye for style, and I am happy to have his irises to remember him by.